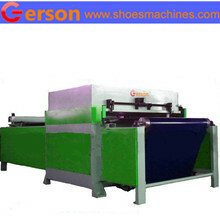 1.Gerson Auto Balance Hydraulic Full Head Cutting Machine is one of die cutting machine manufacturer and designed by Gerson machinery. 1.The main beam press machine adopts double oil cylinder, double-crank connecting rod balancing, four-column precise guiding mechanism, which an guarantee that the cutting depth at every cutting position is same. 2. The pressing board carries out slow cutting when it presses downward to contact the cutting die, which can make that there is no size error between the uppermost layer and lowermost layer of cut materials. 3.Automatic central lubrication system continuously lubricates all the main beam press machine bush and bearing. 4.Attach with optional feeding system to achieve automatic die cutting plants for all the specific industries. 5.Low noise device ensures low noise & low shock cutting of the machine. Gerson machinery accept any custom build .